Any of you who are involved in the online cigar community probably know who Barry Stein is. 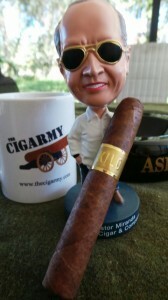 Barry founded acigarsmoker.com, and later handed off that review site when he took a position with Miami Cigar Company. He’s a prominent personality within the industry, and is one of the folks who most everyone fortunate enough to know him would say they are better for it. As detailed in a recent blog post on the Miami Cigar website, Barry had the opportunity to create his own cigar blend this past year – which has been through a number of small, friendly market tests wherein it received quite a bit of praise. 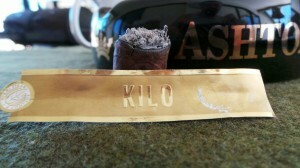 With that warm reception, a decision was made to produce an initial release of his cigar, now named the KILO. One of the small market tests was at an event I attended – the Chattanooga Tweetup. Barry was kind enough to give me a couple of the KILOs to try, and I thought I’d jot down some notes from them here. The KILO will, for the time being, be available in a single robusto (5″X50) format, and is launching officially September 20th at Primo Cigar Shop in Santa Fe, New Mexico. 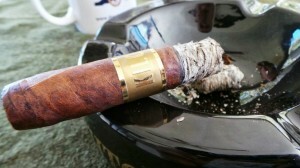 It features an Ecuadoran Sumatran wrapper, cloaked around a Cameroon binder and filler blend consisting of two different Dominican ligeros, a Nicaraguan ligero, and Pennsylvanian Broadleaf. The robusto will retail for $8.00 before local taxes. The KILO is medium brown in coloration, and shows extensive mottling throughout much of its length. While not shiny, it is quite smooth to the touch and definitely “feels” oily. The wrapper leaf is very supple and smooth to the touch. Veining is moderate, and the bunch on both my samples was uniform in density – neither soft nor hard spots were found. Before light, the draw resistance was just about perfect, and provided a mild hay that carries a nice sweetness that borders on graham cracker or brown sugar in flavor. The unlit aroma is a bit earthy on the wrapper, but at the foot I find a deeper, darker sweetness – akin to the cold draw noted above. I find it to almost be molasses-like, actually. Except for what is listed above, I don’t know the exact details of the blend Barry selected for the KILO. There is at least some portion of Nicaraguan ligero in the filler, which makes itself known in the first few minutes of the cigar. What I find most entertaining at this time, though, is the interplay between the ligero’s spice and the PA Broadleaf’s toasty flavor. As I continually explore the various components used in cigarmaking, I find a few leaf varieties that increasingly appeal to me. One of these is PA Broadleaf, which provides a very toasty flavor palette. There is a clear backdrop of an earthy character here as well. This really comes through on the finish for me. I have to pause here and offer some remarks to any of you that happen to be pipesmokers. The finish during these earlier segments of the KILO gives me a very familiar flavor memory. While not a direct match, it puts me in mind of some McClelland Virginia blends. For those who aren’t pipesmokers, the blends of which I speak are NOT what you might imagine as pipe tobacco – I speak not of the typical drugstore variety, heavily flavored tobaccos. McClelland is world renowned for the processing and blending prowess with unflavored Virginia pipe tobacco blends, and are able to achieve a very distinct and pleasing “twang” in their tobaccos. Again, the KILO is not identical in this respect, but leaves that distinct impression in my mind. 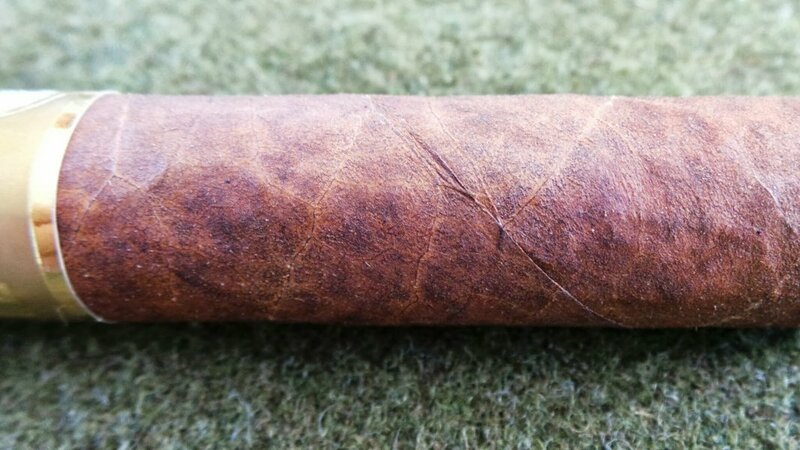 Middle Section – As I progress into the midsection of the KILO, the burn has been very good; I’ve touched up a scalloping burn but I’m a little more compulsive than most cigar smokers. Many would not have bothered, and it likely would have corrected itself. After a start in the medium range, the strength has picked up noticeably, although I’d still put it on the lighter end of full. Other folks smoking the KILO at the Chattanooga Tweetup seemed to classify it as a bit more potent than I…perhaps my tolerance is building :). final stretch – Continuing onward, and into the final stretch of the KILO, I notice the flavors have drifted a little further from the initial sweetness. I’m detecting a bit of a lightly sweet cedar flavor, and some leather. The early brown sugar and graham cracker sweetness has entirely faded into the background at this point, and a little bit of broad citrus has crept in to replace it. This citrus is generic in nature, meaning that I would not place it squarely onto a specific citrus fruit; just a flavor that brings the family to mind. The toasty character has really developed, although it is less emboldened than in the early minutes. It is now more defined and bready in nature. The burn and construction has proven to be spot-on in both examples I’ve smoked. I was concerned with how it might smoke….would the flavors be muddled? Confused? I wasn’t sure if the Cameroon binder would play nicely with the PA Broadleaf. My fears were allayed once I had the opportunity to actually fire one up and smoke it. As it turns out, the components cooperate beautifully. The first KILO I smoked was across a very polluted palate, after a number of cigars at the Tweetup….and I still found plenty of flavor to enjoy (impressive in its own right). The second was on a clean palate as the first cigar of the day after a couple days of not really smoking….and still really dug it. Barry has done an outstanding job of building something that I believe would be a welcome addition to the Miami Cigar lineup. I find myself jealous of the accomplishment; he is living out his dream. I truly hope to see the KILO on my local shelves in the near future….not only would I buy in the future, but I’m ready today. Barry? You out there? Hook up the Tampa market, brother…. Hey Kip. Thanks for the review. Yes, I asked Barry the same thing on Twitter the other day….hook up the Tampa area!! Looking forward to trying the KILO. Good luck Barry. Great review Kip. However, I’m a little concerned when you say you tried it “after a couple days of not really smoking.” Did I somehow miss you slipping into a coma for a few days? One man’s “not really” smoking is another’s smoking “like a madman.” It’s all relative, brother. i can’t wait for it to come to new york city! I hope Miami Cigar makes these fulltime regular production. I really think Barry has a hit on his hands. They’re amazing cigars.